Erle Loran was born in 1905 in Minneapolis, Minnesota on October 3, 1905. After graduating from the University of Minnesota, Loran studied at the Minneapolis School of Art under direction of Cameron Booth. His talent was recognized early when in 1926, he won the Paris Prize, which provided him the benefit of a traveling scholarship to Europe where he lived in the studio of Paul Cézanne. This exposure provided much influence to Loran’s life, where he saw the works of Picasso and other European modernists. But, it was Cézanne’s work that motivated him. His fascination with Cézanne led him on a three-year odyssey through Cézanne country where Loran painted and photographed the countryside around Aix en Provence. It would be this experience that formed the foundation for Loran’s 1943 book, “Cezannes’ Composition”. After returning from Europe, he exhibited extensively. In 1936, he moved to California where be began his long teaching career in the art department of the University of California, Berkeley. 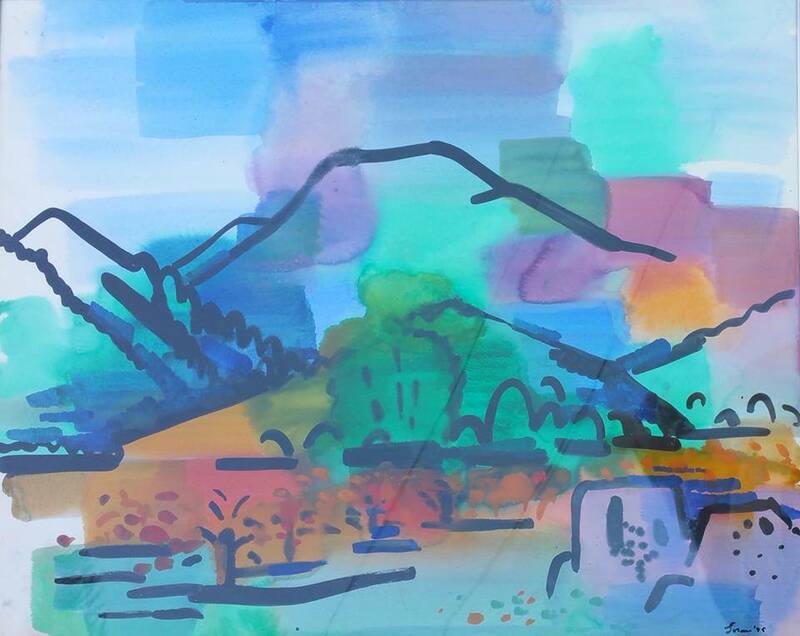 It would also be during this period that Loran would associate himself with modernist Hans Hoffman. Loran served as the department’s chair in the early 1950s, and was awarded a University Citation upon retirement in 1973. His early paintings include lyrical abstractions in primary colors; however, his style has constantly changed with the times. 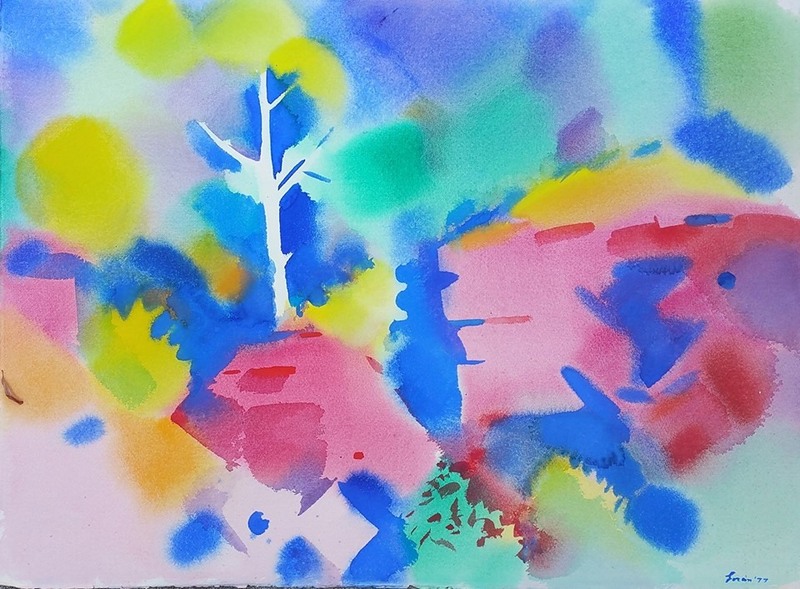 Watercolor was Loran’s medium of choice because it dried fast and was lighter to transport to his often-remote plein air locations, such as the ghost towns of California and Nevada. His landscapes, often to include a building or structure, were clean, fresh, and spontaneous. A sample of his works, ‘Refined Oil Dock’, 1941, is a delightful period piece showing an East Bay refinery with it’s brick buildings and shacks of an oil company silhouetted against the Golden Gate Bridge. In the 1940s, as the war in the Pacific intensified along with domestic tensions, Loran’s work transitioned from plein-air painting to studio work. During this period, landscape painters were occasionally seen as suspicious figures and sometimes mistaken for spies. Loran had such an experience when an armed soldier detained him. Shortly thereafter he decided to focus his painting on abstraction. In the late 1960s, his work became a fusing of Op, Pop, and Hard Edge. From this he moved to figurative painting and later to geometric designs and symbols. In 1960, while in New York City, Loran had further study with Hans Hoffmann who brought European modernist philosophy and techniques to the United States. Among Loran’s many exhibitions were in 1924 at the Minnesota State Fair; the Museum of Modern Art in New York City, 1933; the Rockefeller Center, 1935; Oakland Art Gallery, 1936-1946; the San Francisco Art Museum annuals from 1936; the Golden Gate International Exposition of 1939; California Palace of the Legion of Honor, 1945; California Watercolor Society, 1947, among many others. His works can be seen at the San Francisco Museum of Modern Art, the Denver Museum, the University of Minnesota, the Santa Barbara Museum, and the International Business Machines (IBM) Corporation. Afflicted with a visual impairment, Erle Loran continued to paint until about a year before his death. He died in Berkeley, California on May 13, 1999 at the age of 93. Information on the biography above is based on writings from the book, “Artists in California, 1786-1940, II”, by Edan Milton Hughes, and “The Plein Air Scene”, by Sarah Beserra. Erle Loran was born in Minneapolis, Minnesota in 1905. He attended the University of Minnesota for a while before studying at the Minneapolis School of Art, under Cameron Booth, and graduated in 1926. Loran was awarded a traveling scholarship from the Chaloner Foundation (Paris Prize) after graduation and spent the next four years in Europe, living in Cézanne’s studio. Loran had always been fascinated by the work of the artist Paul Cézanne, and it motivated him throughout his life both in his painting and his writing. He would later pen several books and articles based on his time spent in what was once Cézanne’s world. Once he returned home, Loran moved to California and began not only painting and continuing his art career, but also took up teaching at the University of California, Berkeley. He served as chairman of the art department from 1952-56 and continued teaching there until his retirement in 1973, when he was awarded a University Citation. Berkeley once again awarded Loran, this time in 1981, declaring him an Emeritus Professor. During the 1940s, Loran belonged to a group of some twenty artists that produced lithographs for the “Chronicle Contemporary Graphics” project. Around the same time he published two books (one of which was the successful Cézanne Composition) and two articles in art magazines the following decade. By the late 1960s Loran had changed focus and began painting more abstract images, fusing together Op Art, Pop Art and Hard Edge. Perhaps his new direction was influenced by his time spent in New York learning under the artist Hans Hoffman, an artist from Europe who was heavily interested in bringing modern European techniques and philosophies to America. Loran was eventually hindered by visual impairment, but continued painting until about a year before his death. He passed away in Berkeley, California in 1999. Mariano José María Bernardo Fortuny y Marsal (June 11, 1838 – November 21, 1874) was a Spanish painter. 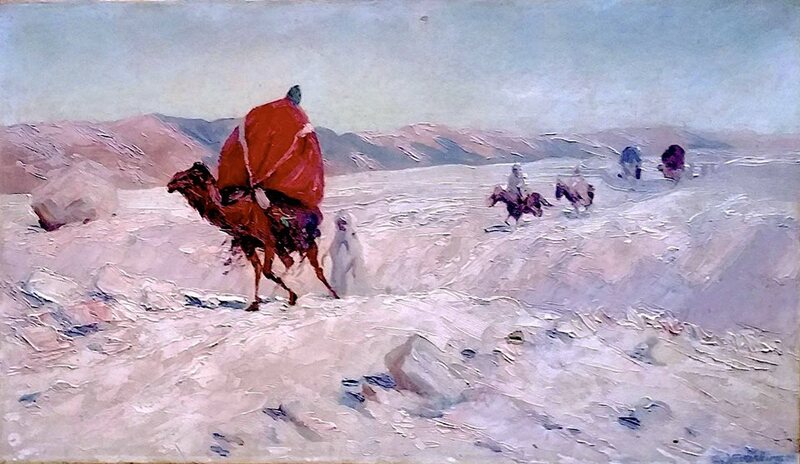 His brief career encompassed both the Romantic* fascination with Orientalist* themes, and a prescient loosening of brush-stroke and color. He was born in Reus, a town near Tarragona in the autonomous community of Catalonia in Spain. His father died when Mariano was an infant, and his mother by the time he was 12. Thus, Mariano was raised by his grandfather, a cabinet-maker who taught him to make wax figurines. At the age of 9, at a public competition in his town a local patron, Domingo Soberno, encouraged further study. At the age of 14 years he moved to Barcelona with his grandfather. A sculptor, Domingo Taleru, secured Fortuny a pension to allow him to attend the Academy of Barcelona. There he studied for four years under Claudio Lorenzale, and in March 1857 he gained a scholarship that entitled him to two years of studies in Rome starting in 1858. There he studied drawing and Grand Manner* styles. In 1859, he was called by the Spanish government to depict the campaigns of the Spanish-Moroccan War. The expedition lasted for only about six months, and he returned to Spain in the summer of 1860. Since the days of Velázquez, there had been a tradition in Spain of memorializing battles and victories in paint; and on the basis of his experiences, Fortuny was commissioned by the city of Barcelona to paint a large canvas diorama of the capture of the camps of Muley-el-Abbas and Muley-el-Hamed by the Spanish army. He began his composition of The battle of Tetuan on a canvas fifteen metres long; but though he worked on and off on it during the next decade, he never finished it. 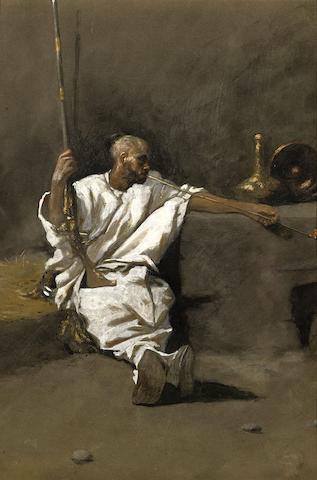 The greater influence of this travel on Fortuny was his subsequent fascination with the exotic themes of the world of Morocco, painting both individuals and imagined court scenes. He visited Paris in 1868 and shortly afterwards married Cecilia de Madrazo, the daughter of Federico de Madrazo, who would become curator of the Prado Museum in Madrid. Together, they had a son, Mariano Fortuny y Madrazo, who became a well-known fashion and tapestry designer. Another visit to Paris in 1870 was followed by a two years’ stay at Granada, but then he returned to Rome, where he died somewhat suddenly on November 21, 1874 from an attack of tertian ague, or malaria, contracted while painting in the open air at Naples and Portici in the summer of 1874. 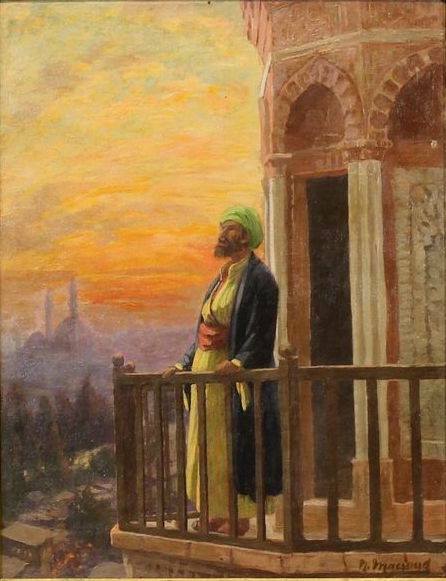 “his marvellously sensitive eye … discerned the stalls of Moorish carpet-sellers, with little figures swarming, and the rich display of woven stuffs of the East; the weary attitude of old Arabs sitting in the sun; the sombre, brooding faces of strange snake-charmers and magicians. This is no Parisian East…every one here speaks Arabic”. Fortuny often painted scenes where contemporary life had still not shaken off the epaulets and decorations of ancient traditions such as the ”Burial of a matador” and couples signing marriage contracts (La Vicaria). Each has the dazzle of bric-a-brac ornament, but as in his painting of the ”Judgement of the model”, that painterly decorative air of Rococo and Romanticism was fading into academicism and left to confront the naked reality of the represented object. He inherited Goya’s eye for the paradox of ceremony and reality. Watercolour was one of the most characteristic modes of artistic expression in the 19th century. Although it was already used by Spanish painters of earlier generations, it reached its high point in Spain with the work of Mariano Fortuny (1838-1874). Fortuny’s prominent position in the international art world of his day resulted in widespread imitation within Spain of all the aspects of this Catalan artist that had brought him fame, particularly his interest in technical experimentation. 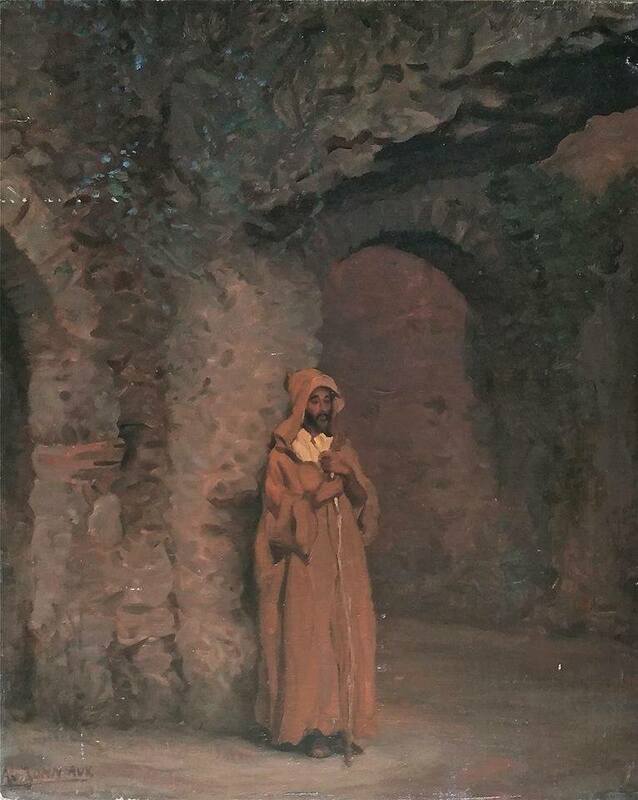 While Fortuny used watercolour in the same way as many of his contemporaries, with the aim of capturing his impressions of landscapes and of deftly and rapidly conveying his ideas in an immediate manner, he is most noted for his richly pictorial works on paper in this technique, which reveal close parallels with his finest work on canvas. As a result, collectors and art dealers of the day considered Fortuny’s watercolours as important as his most exquisitely painted and highly prized paintings.